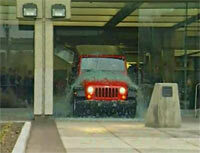 Wrangler Crashes Through Cobo Hall - How'd They Do It? We are not set up to do large volumes of video serving. We went through a lot of trouble to get this video up. Please do not link this video from other sites. Please ask viewers to visit our site to view the video. Thanks!